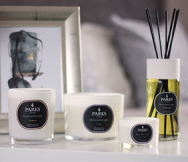 The Parks Candles’ Nature’s Own range was created so that our customers could easily find the purest, least processed and most natural aromatherapy grade candles, reed diffuser scents and other products in one place. These products all work to subtly change the mood of a home, office or any other space naturally in a very sophisticated manner, whilst also protecting anyone who might suffer from allergies, asthma or breathing difficulties from harm. The Mediterranean Spa scent is quite unique and composed of Andalusian Verbena, Clove and Citrus scents. It is a lovingly handcrafted aromatherapy grade scent mixture that will last continuously for months. Many use this scent as a study aid as Verbena and Andalusian verbena, in particular, are said to aid concentration and even the retention of information. It also banishes stress and anxiety, contributing to the spa-like atmosphere of this mixture. Andalusian verbena is often called ‘lemon verbena’ due to its unique, tart scent, which makes it an excellent partner of the next of the tree key scents in this mixture. Citrus scents generally act as mood lighteners and stress relievers as they make most people happy and remind us of lazy afternoons in the Mediterranean sun. Clove is said to do everything from relieving sore muscles to helping those who suffer from arthritis. The scent is unmistakably spicy and warming and tends to remind one of the winter holidays. As a part of our Nature’s Own range, the Mediterranean Spa Reed Diffuser Set makes a lovely gift.